How to use Your Free Trial. This version of CAD Replace runs on Windows 7 - 10 x64, it runs in AutoCAD. Download it - click the green button. After you check the download for my digital signature (right-click, "Properties", "Digital Signatures" - that's a good habit to get into), run the installer you just downloaded. Next time you open AutoCAD you should get a notice that you are running a trial of CAD Replace. When AutoCAD is ready for you, start CAD Replace on the command line with: CADreplace - just type that in on the AutoCAD command line. April 2, 2019: the new version resets all previous trials. To try CAD replace again just download the new version. The trial experience is much improved, as are a many things inside the App. Download it here or use the Green Download Button. The trial & paid app are in the same download. 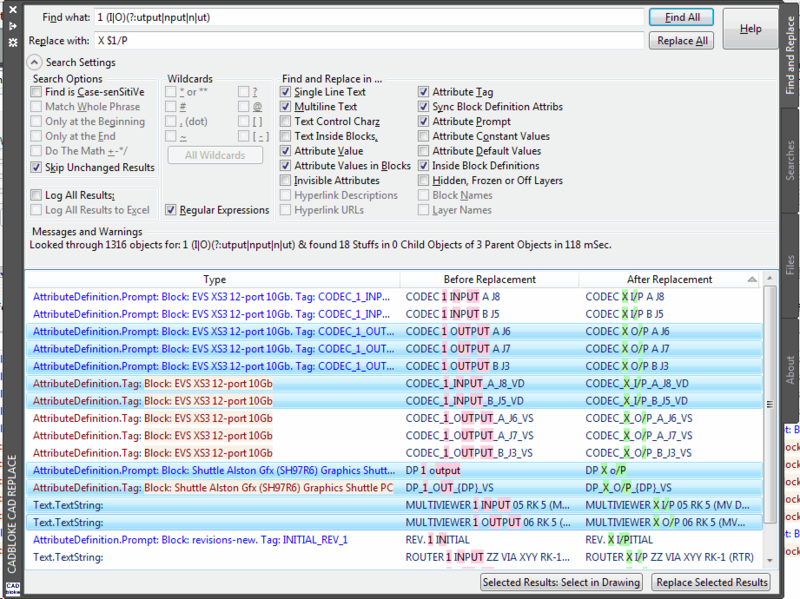 CAD replace requires .NET 4.6 framework or newer - .NET 4.5 is obsolete and AutoCAD 2013 or newer. Forget the frustrations of opening-closing-opening-closing-opening...the FIND command window when you need to copy some text, select a few more things, pan a little, or just check something. The Palette is here when you need it and out of your way (but still there!) when you don't. CAD replace always keeps your results for you instead of losing them forever when you need to close that infernal FIND window. You won't miss what you Find nor what you Replace it with. You can see exactly what will happen. Select any combination of results to Replace or Select only those you choose - those buttons will appear at the bottom when you select any Results in the list. Double-click any result to zoom to it in your drawing for a closer look. The Search Settings can hide away if you want to clear the clutter for a little while. 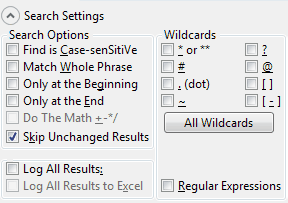 Don't freak out at the "Find" text in the picture, that's a regular expression - think Wildcards (* ? # etc.) on steroids. CAD replace does normal text, and normal wildcards too. The "Searches" tab is where you can make a list of different searches to do all at the same time. You can load, save and edit these searches and make lists of searches to do all at once. The "Files" tab is coming soon, you will have a list of drawings to do your list of searches and replacements with. CAD replace will save all the results of those searches in an Excel file with the same highlighting as your results list you see here. You choose what to replace and what to skip and then tell CAD replace to do the work. 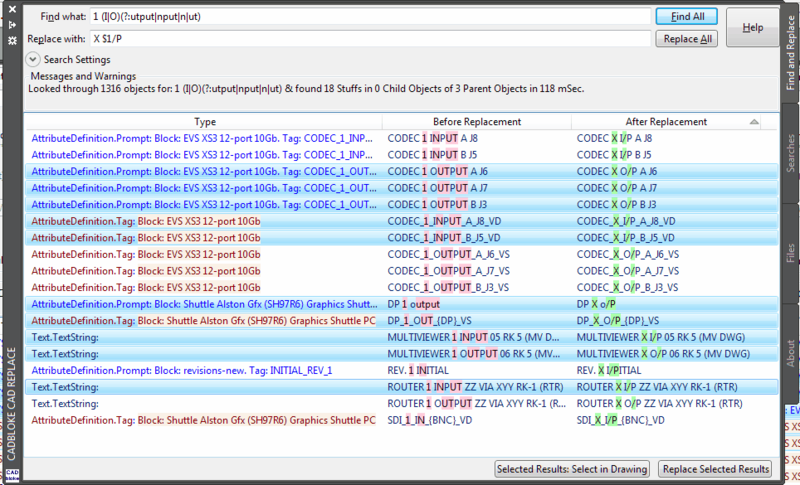 CAD replace is fast, about 10x faster than the standard FIND command. 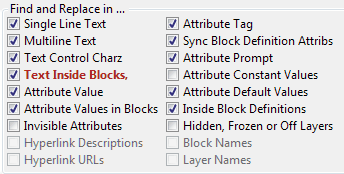 Replace Attribute Tags inside Blocks and keep them in sync with their block definitions - and keep all your attribute values. When it does a Block Definition replacement the results will list every Block Reference that was modified too so you can zoom in and see them. You are looking at the AutoCAD® version - if you want to have it in BricsCAD® (coming soon), IntelliCAD®, NanoCAD® or any other CAD then let me know - I am building this for All of Us. Have Your Say. Wildcards in the standard FIND are All or Nothing. In CAD replace where you can pick and choose your wildcards, your settings. Don't panic if you forget what things do, there are plenty of pop-up hints and documentation at your fingertips to guide you on your way. If you don't find it, just ask. Did you even know there was a . wildcard? Did you know * is lazy in AutoCAD's FIND command? That's why you can now have the ** option - sometimes you just need to be greedy. Want to know more? Want more options? Just ask. See exactly what you found, what type of object it is including the name of the block it is in, the Tag of the Attribute etc, and what the Replacement will be. You can easily sort by any of the columns, just click on the heading. You can double-click any result to zoom to it, selectively Replace any combination of results, all with the usual UNDO we all know and love. ​Nothing is more powerful for manipulating text than Regular Expressions. If you don't know Regular Expressions then...I kind-of envy you...but take my word for it, it is awesome. You can safely ignore it if you don't want to go down that rabbit hole. You don't need to know it. Ah, no, you're not going mad - there is something missing in that picture, the Search Settings toggle away so you can focus on Your Results. Download your free trial, just click the green button.